Upper extremity orthotics are designed to help restore or improve function in the area of the hands, arms, shoulder and neck. Some common reasons your doctor might prescribe you an upper-extremity orthotic include trauma, a debilitating or painful condition such as arthritis, or a neurological impairment such as stroke. Lower limb orthotics are designed to restore or improve function in the area of the feet, legs and hips by controlling motion, providing support, preventing progression of fixed deformities, or reducing pain. Lower limb orthotics are commonly used. In fact, anyone with pain in the area of the feet — from top athletes to the elderly — can likely benefit from orthotics. Bay City OrthoCare offers both off-the-shelf and custom-made lower limb orthotics. Bay City OrthoCare welcomes walk-in patients in need of non-custom orthotics. We have nearly two dozen types of ankle-foot orthotics in stock at all times so we can immediately fit your needs and your physician’s specifications. 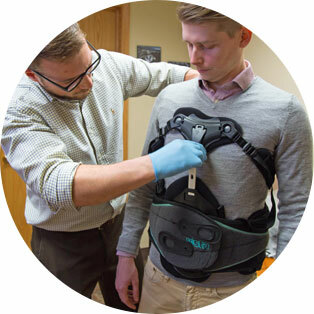 We make most necessary modifications to an off-the-shelf orthotic on-site — and without an appointment. We often utilize our in-house lab to make custom orthotics. Whether in-house, vendor supported or a combination, we utilize the latest in technology to create an orthotic specifically for you. We require custom-fit and diabetic shoe clients to make an appointment because the process of caring for your custom orthotic needs takes more time. Call one of convenient offices to schedule an appointment.